Frankie & Coco PDX is a design studio in Portland, Oregon. We specialize in modern, beautiful, functional bags, accessories & housewares. 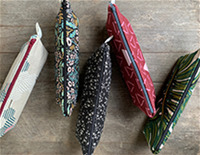 We celebrate color, pattern and texture with meticulously handcrafted goods. Our style is joyful & exuberant, yet relaxed. 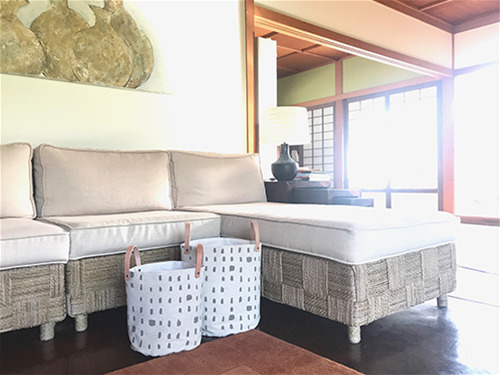 Our Fremont Basket is the perfect balance of functionality and style. Perfect for storing all your household items, such as shoes & toys. Great for plants and doubles easily as a market tote. Made out of a heavy, textured woven canvas with hand cut vegetable tanned leather handles & brass hardware. Comes in three sizes and a variety of modern prints & solid canvas. The new L A N D S C A P E Collection, featuring beautiful textiles, colors and textures hand pieced to create unique works of art. 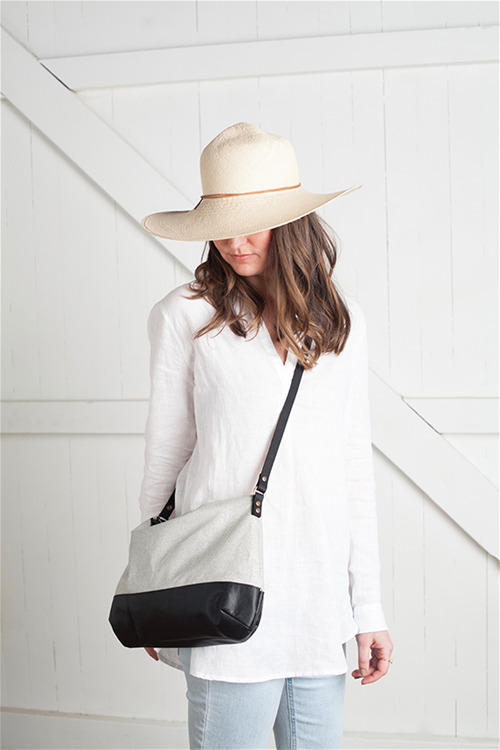 This beautiful & versatile bag is simply perfect. 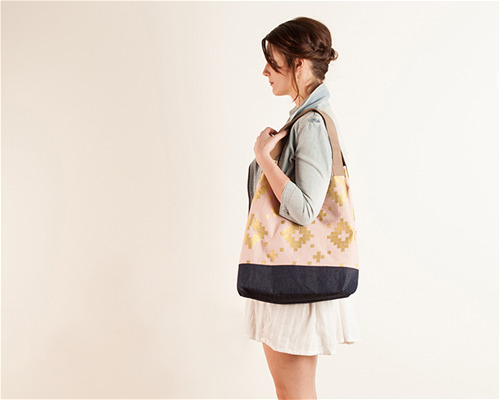 Made out of a pale pink & gold linen canvas print and your choice of denim or leather bottom. It is fully lined in a sturdy canvas with a coordinating roomy interior pocket, brass hardware and premium leather handles. Leather will soften with wear and develop a natural patina over time. This generously sized bag will fit everything you need for a busy day; such as your computer, files, sweater, flowers, makeup, iPod, etc. The premium brass snaps easily convert it from a chic hobo to a roomy tote, depending on your needs. This bag effortlessly carries you from office to market to cocktails! Dimensions are approximately 17" x 13" x 6" as a hobo and 17' x 23" x 6" as a tote. Made with love in our Portland, Oregon studio. This modern zippered toiletry bag is perfect for running to the gym, a weekend getaway or as a sweet gift! It comes in two sizes! The large holds everything you need, such as hair care products and other beauty/skin essentials. It pairs perfectly with the small toiletry bag, which is the perfect size for makeup and other accessories. 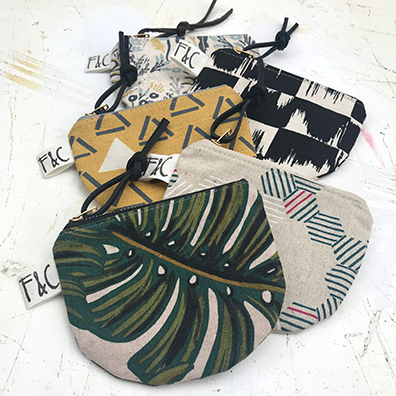 These unique and handcrafted bags measure approximately 7" tall x 10" wide x 6" deep for the large and 5" tall x 8" wide x 4" deep for the small. Made in modern linen canvas prints & solids. Fully lined in gray nylon (water repellent). Heavy duty YKK brass zipper closure with leather pull. A unique, lovely bridesmaid gift and an absolutely perfect holiday gift! Made with love in our Portland, Oregon studio. Spot clean only. 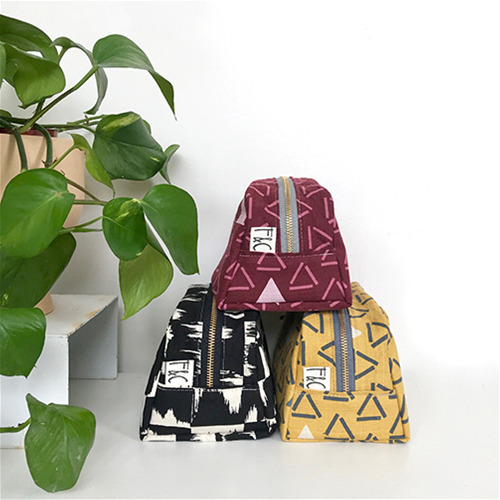 The new I M P R I N T Collection, featuring beautiful textiles, colors and textures hand pieced to create unique works of art. Made in a modern modern linen canvas prints. Fully lined in a solid cotton. YKK brass zipper closure and leather zipper pull. Spot clean only. Handmade with love in our Portland, Oregon studio. Made out of a lovely silver linen canvas print and a luxurious black leather bottom. You can also choose other materials for the bottom. It is fully lined with interior pockets, brass hardware and a premium hand cut leather strap. Brass zipper closure with leather pull. This lovely bag will fit everything you need for a busy day, while still being light & comfortable. Dimensions are approximately 11" tall x 14" wide x 4.5" across the bottom. The new I M P R I N T Collection, featuring beautiful textiles, colors and textures hand pieced to create unique works of art. 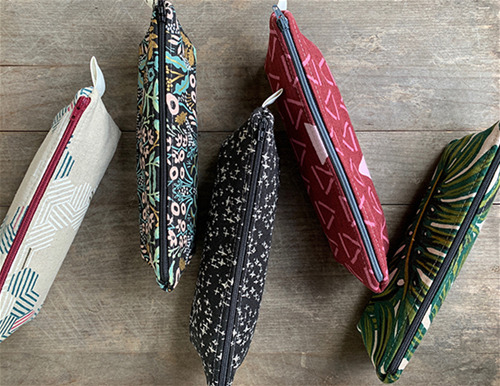 Versatile, handcrafted, modern zipper pouch. Perfect for keeping all your items organized, such as pencils, art supplies, makeup, toiletries, jewelry, etc. Easy to throw in your purse or bag. Made out of modern linen canvas prints and solids and fully lined in a solid canvas for durability. Approximate dimensions are 3" tall x 9" wide x 2" deep across the bottom. Spot clean only. Makes a great wedding favor, birthday present or keep it just for yourself!